In 1946 Laura Sparks Blossfeld wrote a letter to the Bergen Record inviting parents to come together to create a better world for their children. Laura Sparks Blossfeld wrote "So come on: you parents of Bergen County. Lift your chins and get together and form what may well prove to be the first chapter in a nation-wide organization" ... and so they did. From that letter, a group of determined parents founded the organization that would become The Arc of Bergen and Passaic Counties. We salute Laura Sparks Blossfeld and the founding parents for their vision and toil and wish them a very Happy 70th Anniversary. On October 12, 1946, a mother's letter appeared in the Bergen Evening Record, Hackensack appealing to other parents to come together and form an organization " that may well prove to be the first chapter in a nationwide organization". 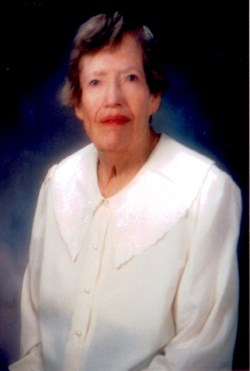 Laura Sparks Blossfeld was the mother who wrote the letter and she was inspired by her son Ricky who was born November 27, 1937. At age three, when Ricky's younger brother surpassed him in development, he was diagnosed by a psychologist as being "50% retarded" (a term used then but which we do not use today). 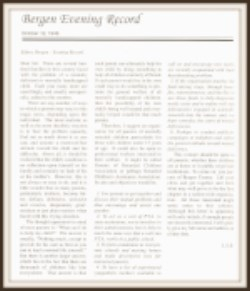 The letter served as a clarion call to parents of children with intellectual disabilities. Judge Morris Dobrin of Fairlawn was the first to reply to the letter and Mrs. Kenneth White, wife of a psychology professor was the second. After numerous letters and phone calls, a meeting was arranged at the Blossfeld home for December 21, 1946. Two couples including the Dobrins braved a snowstorm to attend. Excerpted from " A Study in Progress" which was published in 1969 by what is now The Arc of New Jersey and from the Arc of Bergen and Passaic's archives. 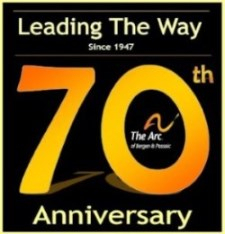 Check back for what happened next on the journey through The Arc's 70 years of Leading The Way. Leading the Way for 70 Years - Happy Anniversary 1947-2017!